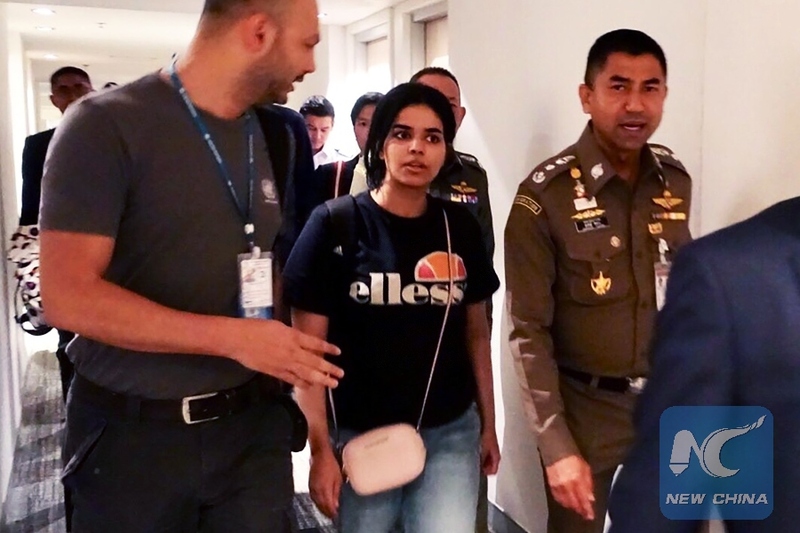 OTTAWA, Jan. 11 (Xinhua) -- A Saudi woman, who reportedly fled her family over abuse and barricaded herself in a Bangkok airport hotel last week, is coming to Canada, CTV reported on Friday. Canada signalled on Wednesday that it would be open to accepting the 18-year-old Saudi woman named Rahaf Mohammed al-Qunun, who had asked Canada for help via her Twitter account. Previously, several countries including Canada and Australia were in talks with the United Nations refugee agency in Bangkok on accepting Qunun. Qunun grabbed global attention when she sent out pleas for help via social media in Bangkok last Saturday. Upon arriving at Bangkok's Suvarnabhumi Airport Saturday night, Qunun said she was met by a man whom she identified at various times. The man took her passport and said he would help her gain entry to Thailand. When the man returned about an hour later with a few other people, they said they knew she ran away and her family wanted her back to Saudi Arabia. She was sent to a hotel room and told she would be put on a Monday morning flight to Kuwait. Qunun then went online for help over Twitter, writing of being in "real danger" if forced to return to her family in Saudi Arabia and might be killed. She told the BBC that she had renounced Islam and was fearful of her father's retaliation. She was allowed to enter Thailand temporarily under the protection of the UN refugee agency, which is expected to take about five to seven days to study her case and her claim for asylum. Her father has reportedly denied physically abusing her or trying to force her into an arranged marriage. He said he wants Qunun back but respects her decision.